If there's one things we love more than home decor accessories, it's affordable home decor accessories...the kind you want to brag about because they look far more expensive than they really are. The kind that might be small in stature, but can instantly refresh your room - whether it's a colorful throw, a unique piece of art or a decorative object. 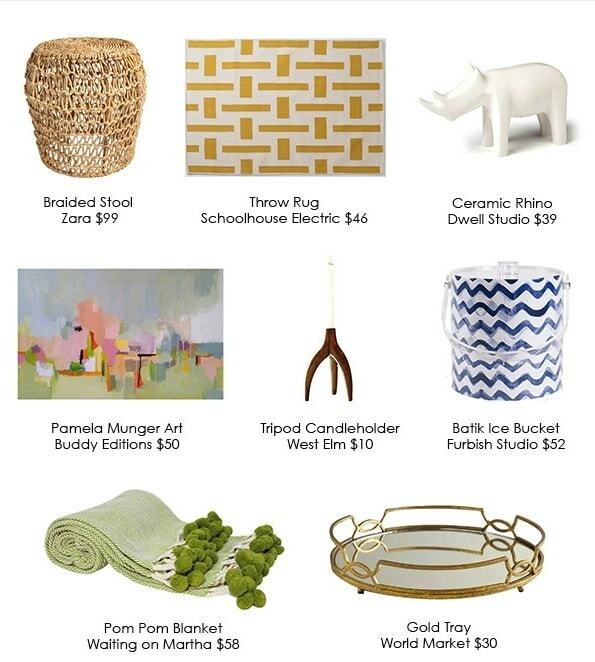 Decorist Head of Design Services Ashley Redmond and our newest Decorist Celebrity Designer Celerie Kemble collaborated on a "hot list" of affordable decor accessories under $100 that every home needs, now. We love this chic little natural wicker stool from Zara Home as it adds subtle texture and can be paired seamlessly with any palette. And even better it can double as a side table. Here's to versatility. Throw rugs are a perfect way to update any space. We love to layer a colorful, patterned rug - like this summery rug from Schoolhouse Electric - over a natural area rug to add texture and depth to a space. Every space needs a touch of playful personality, whether it be through a fun objet or bright pop of color. Animal objets, like this darling rhino from Dwell Studio, are a great way to add whimsy to a room. Original art - like this abstract painting - adds a unique, personal touch to almost any space. Buddy Editions and Etsy are two great sources for affordable original art. Candles are both functional and decorative - they can set a great ambiance in a room, and paired with the right candlestick add a sculptural element. Bunch a few with varying heights to create a small vignette on your coffee table or mantle. These wooden tripod antler candleholders from West Elm are a serious steal, on sale for $10! Nothing signals summer like a cheerful ice bucket, like this blue batik ice bucket from Furbish Studio. We're always on the hunt for stylish throws, like this lime green herringbone pom pom throw from Waiting on Martha. They're a great way to add color and texture to room (and stay warm in the process!).. The perfect anecdote to an otherwise dull sofa. We never get tired of metallics. This mirrored gold tray from World Market is an absolute favorite; the rich, antique brass finish mixed with the mirrored base will add a touch of sophistication to any space. A coffee table book can help ground a table. Plus, it's a great conversation starter! Choose a topic that you love - whether its design or photography or travel - and go from there. The power of paint is underestimated and is a quick and cheap update to any space. Don't be afraid to use a bold color and make a statement. This energetic paint, , will do the trick. Happy shopping! And if you have a question about any of these fab accessories or need helping styling them in your space, ask a designer (for free!) here.